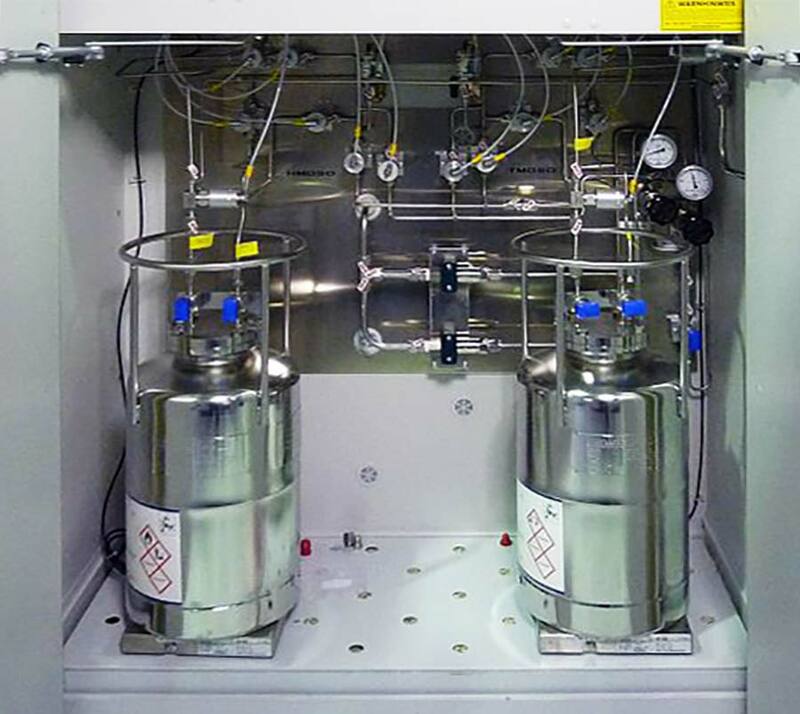 Precursor supply systems are designed for the safe supply of liquid precursors to liquid control systems or vaporizer systems, such as the VS-100 series. Silanes, Chlorides and Metalalkyles, e.g. SiCl4, TiCl4, SiHCl3, HMDSO, DEZ, TMA can be safely supplied. Each system is designed to meet the special requirements of its application. The supply system delivers precursor from one bulk container. For applications where no flow interruption can be tolerated, a version supplying from 2 containers is available. As the first container runs dry, the system will automatically switch over to the second container. The transport bulk container is placed in the system’s cabinet and connected to the tubing. Valves are pneumatically operated and controlled automatically by the local control system. 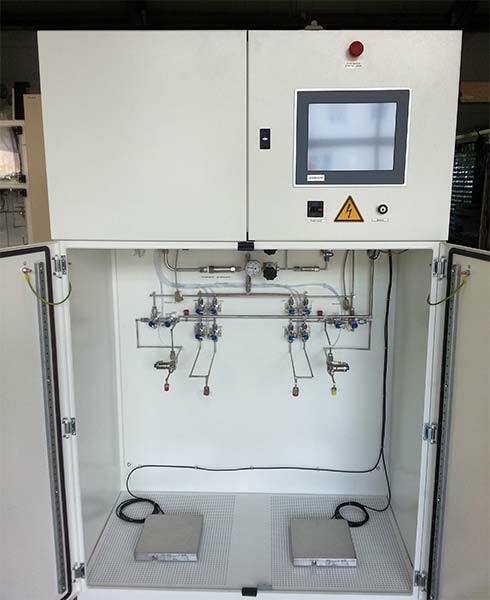 After a new container has been connected to the system, first the tubes areset under pressure and a pressure-drop test is performed. Has this test been completed successfully, a pump-purge cycle starts to clean the connecting tubes (flow of N2/Argon followed by evacuation, repeated several times). To enhance the purge procedure diaphragm valves are used in the whole system. 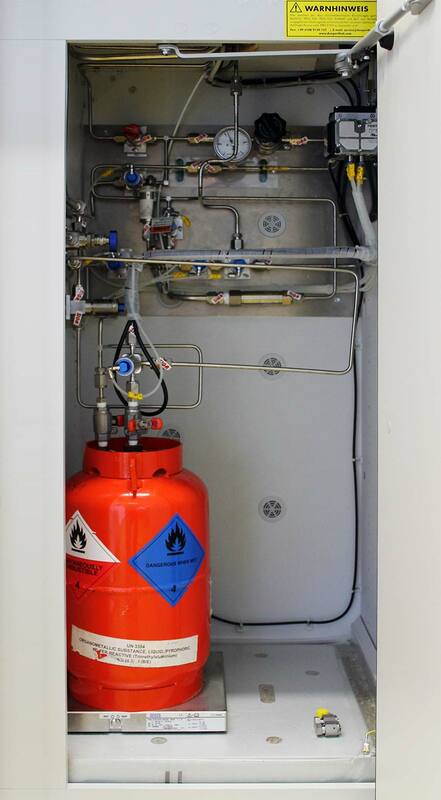 After completion of the pump-purge cycle the new container is clear for delivery to the connected consumers. After the container has run empty, first the remaining precursor still inside the connecting tubes is pushed back to the container. Valves used in this section are dead space minimized 3-port valves to enhance the purge cycle. 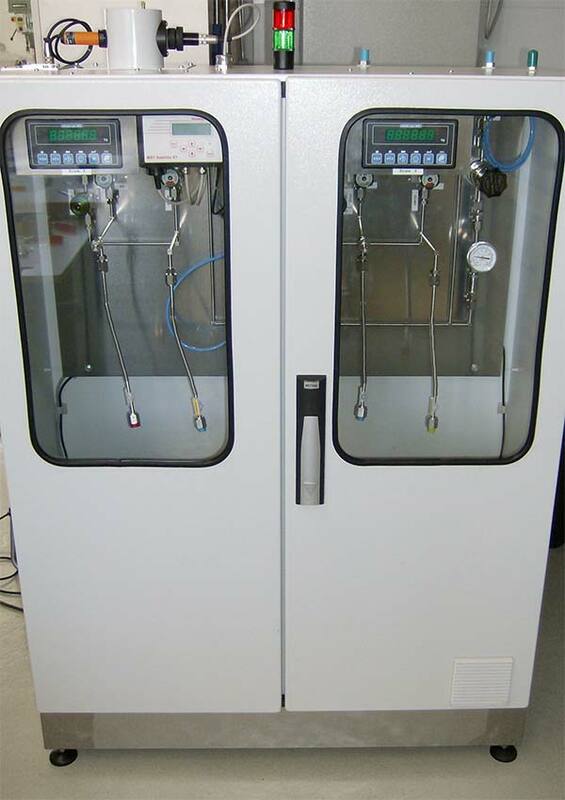 A pump-purge cycle to all connecting tubes follows. While the automatic pump-purge sequence is running, the manual valves of the container have to be opened and closed. The operator is instructed to do so by messages on the touch panel. The container is placed on a scale. Remaining precursor is continuously monitored and displayed. A pre-alarm is displayed as the level in the container falls to a low level. A second alarm is displayed as the container reaches the empty level. A supply system with two containers then automatically switches over to the second container waiting in standby. 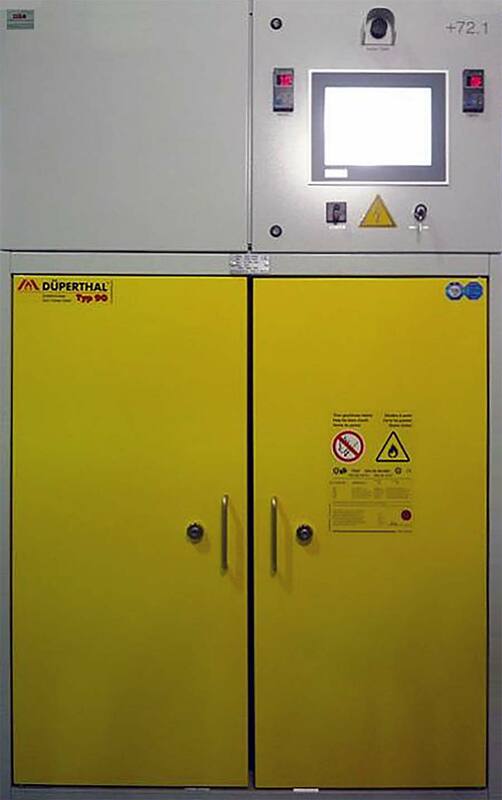 The system is housed in a regular steel panel housing or in a fire resistant F90 safety cabinet (will resist an external fire for 90 minutes). 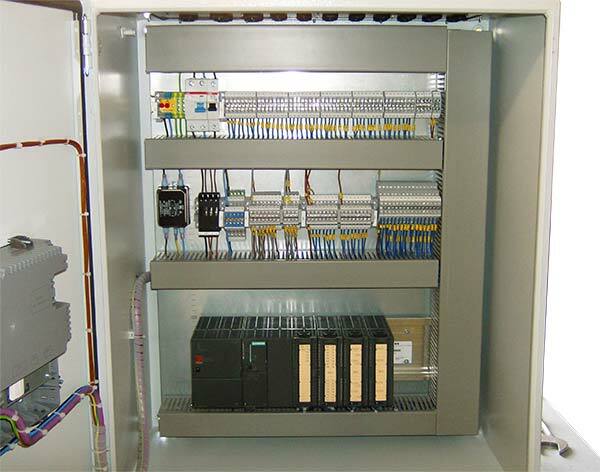 This means the system can be installed inside the laboratory or work space. Cabinets are connected to an exhaust system and may also be supplied with fresh air. To increase safety, the systems can be equipped with a gas monitor or a smoke detector, depending on the precursor in use.